Meet Adam Levine! Not the front man for Maroon 5, but the local guitarist, composer and arranger who lives and performs on the Central Coast. His group, Human Nation, which has roots in jazz, blues, Latin and funk, melded with world rhythms, will be releasing their first CD later this year. Human Nation has performed to admiring followers at his favorite local venue, D’Anbino Vineyard and Cellars tasting room, as well as other wineries, the Paso Robles Ballroom, the Paso Robles City Park, and private functions. Adam’s precise finger work is featured in his upbeat composition Django’s Delight, an “homage to my guitar hero, Django Reinhardt,” the pioneering European virtuoso “gypsy” or “hot” guitarist. Besides Adam on acoustic and electric guitar, other regular Human Nation band members include Danny Pelfry on sax, clarinet, flute and steel pan; Bill Wingfield on acoustic and electric bass; Brett Mitchell on keyboards; and Dean Giles on drums and percussion. Dave previously performed around the world as a bandleader and sideman on luxury cruises, at Walt Disney World and Universal Studios in Orlando, as well as with The Temptations, Manhattan Transfer, Smokey Robinson, and Marvin Hamlisch. He presently teaches sax at Cuesta College. Bill started performing professionally at age 16. After a musical career hiatus, he returned to playing in 1999, and like Adam, he also has been an instructor at the National Guitar Workshop. Brett studied at NYU with many famed musicians including Paul Simon, and he wrote music with classmate/friend Melissa Manchester. 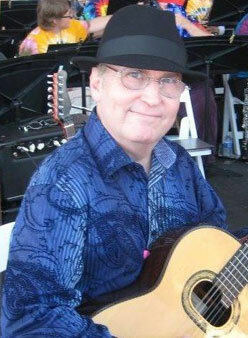 (For detailed information on Brett, see the February 2013 Mostly Music column). Dean has worked with many successful artists, and recorded music for film, television, and commercials. The Human Nation CD was recorded locally and they are presently finishing mixing in Los Angeles where they were pleased to have Ron Wagner, percussionist with Cirque du Soleil, lay down tracks. Before coming to the Central Coast, Adam played too many places to name, some highlights being Branson, Missouri (known as the “Live Music Show Capital of the World”), New York, San Francisco and Los Angeles. He does composing and arranging, and has done studio session work including Capitol, Warner Brothers, and Motown Records. His commercial credits include McDonalds, Taco Bell and television show such as “Cheers,” “Simon and Simon,” “Merv Griffin,” and “Lawrence Welk”. Following the birth of his son in 1995, Adam and his wife, a classical pianist, decided to move to the beautiful Central Coast, where they had previously visited, seeking a more family-oriented environment. Adam expected to find a shortage good local music on the Central Coast. Instead, he was surprised by the many talented musicians with whom he has been able to work, and he is now busier than ever. In addition to Human Nation, he regularly plays in three other groups. Counterpoint is a cabaret-style group, primarily spotlighting Big Band and contemporary pop, featuring vocalists, Brett and Julia Mitchell, Mostly Music column), Karinda Scott, and Steve McAndrew, with Brett on keyboard, as well as Human Nation musicians Bill Wingfield and Dean Giles all comprising the core group. It is very common for musicians, especially those doing jazz, to perform with multiple groups. This is the case for the two groups, the No Ego Amigos, which features Adam, Brett Mitchell, and Mike Swan on bass; the other trio features Adam, Brett and Judy Philbin on vocals. Both trios draw from the Great American Songbook during their regular performances on Thursday evening at the La Bellasera Hotel conveniently located on the southern outskirts of Paso Robles. La Bellasera is an intimate venue where one can relax by the fire and enjoy food or drink while the band plays within a few feet of the audience’s seating. This locale has the added benefit of easy access, no cover charge, and an early starting time of 6:30 p.m.
Raised in Baltimore, Adam started playing guitar at the same time his father took up guitar. According to Adam, “my father turned me on to bossanova.” Then Adam discovered the Beatles and decided he would play guitar for a living. He has studied at the Berklee School of Music and the Aspen Music School. He has studied privately with the venerable Joe Pass, generally considered to be one of the greatest jazz guitarists of the 20th century. Adam is passionate about teaching guitar, including at the Aspen Music School, Musician’s Institute and National Guitar Workshop in San Francisco, and the Grove School of Music in Los Angeles, and currently with his local private students. Regarding his present 20 students, Adam relates, “I love teaching. It keeps me balanced.” His students have done on to play with such stars as Norah Jones, George Benson, and Celine Dion. He also relishes collaborating with other local musicians, such as George Wilkins, whose many accomplishments include a seven year tenure as Composer in Residence at Walt Disney Production, as well as Director of Music for Walt Disney Imagineering. Adam shared that this past Christmas, he and Human Nation and other musicians got together for an impromptu jam session, which included George Wilkins performing rare vocals; Kenny Lee Lewis, former lead guitarist, now bassist with the Steve Miller Band; Danny Pelfry, former sax player with Tower of Power, on guitar this night; and Danny Weis, one of the founding members of Iron Butterfly. Asked about memorable or amusing anecdotes, Adam recalled that when performing on the Merv Griffin Show, Scottish singer, and guitarist, Donovan, asked to borrow a “plektrum.” Unsure what that was, Adam offered his guitar pick; a lucky guess apparently, as the pick was never returned. Adam recalled another memorable incident during the opening night of the Lawrence Welk Show when the bubble machine went out of control, dropping soapy liquid onto the sheet music, causing the ink to run. For more information about Adam, Human Nation’s release date and performances for Human Nation’s new CD, or performances by other groups in which Adam plays, find him on AdamLevinemusic on Facebook, or www.Human-Nation.com.